Tackling a home renovation project requires a great deal of planning and focus on detail. From the interior to the exterior, from engineering walls to choosing tile, every decision and detail add up to be much more than the sum of their parts. This Durham family decided to give their home a modernist makeover. Every detail was carefully selected to achieve the signature minimalist style, clean architectural lines, and open-space feeling. When it was time to replace the outdoor deck and front entrance, they asked our Archadeck of Raleigh-Durham design team to customize their new space in keeping with the rest of their modernist renovation. In keeping with the house renovation, we designed and built a large, single-level deck accessible from multiple rooms of the house for the homeowners to enjoy. The shape of the expansive deck was essential in achieving clean architectural lines as we used sharp, right angles to reflect the right angles of the home’s roofline, walls, and doorways. The Fortress rails in black sand with square balusters minimize the visual obstruction of the railing, adding to the sense of openness and connection to the landscape. 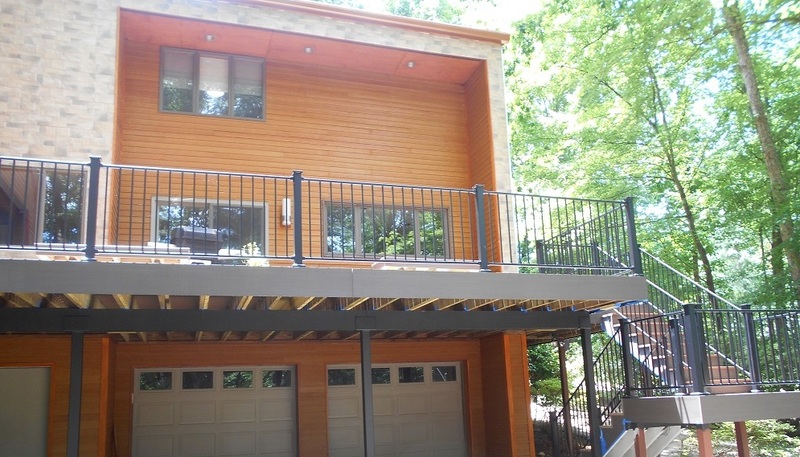 To complement the structural look of the deck from the ground, we utilized metal posts instead of pressure treated pine in keeping with the style of the railings. The clean, sleek lines of the deck, railing, and posts give the space an overall sense of calmness and serenity. The feeling of calmness and serenity is further achieved by the warm color scheme of the decking boards. Although its shapes and lines can be quite sharp, the modernist design aesthetic features warmer earth tones as a signature color. As such, we used AZEK Morado (red) composite decking with AZEK Dark Hickory (dark brown) border and parting boards. We added matching built-in benches using the same AZEK composite decking materials that were used on the deck floor. The effect is that the benches blend in with the floor, keeping the space feeling as open and warm as possible. No matter what style your home is, we can create a custom deck, porch or outdoor living space that maintains the integrity of the design while giving you beauty and function. If you are ready to create a new deck, porch, or patio to complement your home, give us a call today: 919-973-1523 We look forward to working with you!